In China there is a special paper, famous as one of China’s Four Treasures of the Study, that has proved to last a thousand years. Most of the ancient Chinese painting and calligraphic art which survives today is thanks to the durability of this Xuan paper, which is resistant to creasing, corrosion, moths and moulds. The paper ages so well that old paper is a highly valuable collectable item with >100 year old blank paper selling for over 1,000 dollars per sheet. Of course you don’t need to invest that much to get the real paper, since the full traditional process is still in use today – some artists stock up on the paper when they have money and keep it to age. A common theme is: when I was young “Xuan paper was too expensive for my family” … “now I only use the best Xuan paper”! 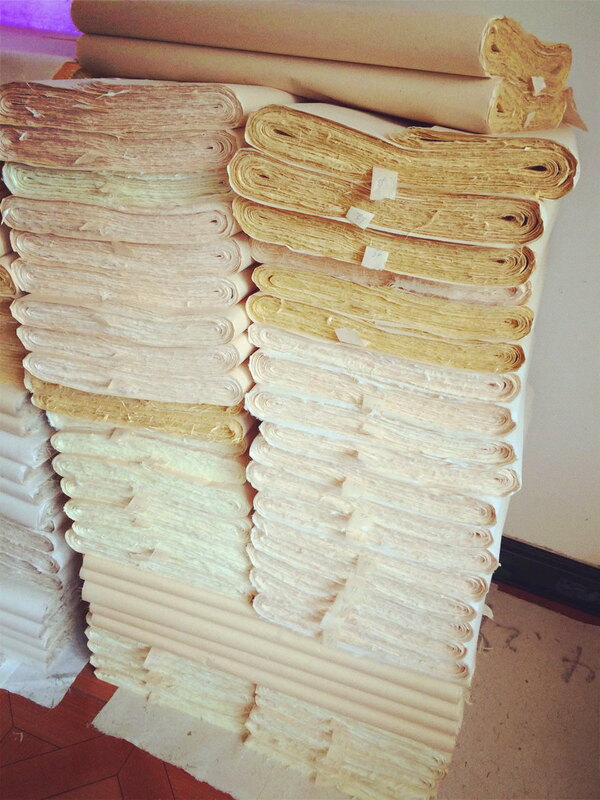 What to look for in choosing Xuan paper? See also Xuan Paper Buyer’s Guide. Thickness: Standard single Xuan paper is light and thin and translucent. It is popular with professionals but is quickly saturated with ink, so different grades are also available to cater for different artistic styles. Decorative finish: ‘gold fleck’ paper is the most famous, the paper has flecks of gold paint through it. Apart from gold, there are alternatives including embedding fragrant plant materials to make a scented green fleck. Colour: standard colours are in grades of white-cream, additionally red is a popular colour since Red is the traditional colour for good luck and prosperity in Chinese culture. Composition: the purest Xuan paper is 60-90% bark from the Peteroceltis tatarinowii tree (青檀 / 青檀 Qīng tán also known as Wingceltis or blue sandalwood in English) capable of producing very fine thin paper. The remaining percentage is mostly稻草 Dàocǎo rice straw, hence Chinese paper is also known as Rice Paper. For a ‘fluffier’ alternative, ‘Cotton Xuan’ reverse the proportion of materials to eg 40% bark, 60% rice straw, this thicker paper can hold more water so allows the artist to do moisture washes and shading which might not be possible on the raw Xuan since the raw Xuan becomes saturated with one layer of water-based paint. Raw or ‘uncooked’ Xuan Paper: (Chinese 生宣 shēng xuān) this type of Xuan paper is ‘unsized’ and has very high water absorption rate. 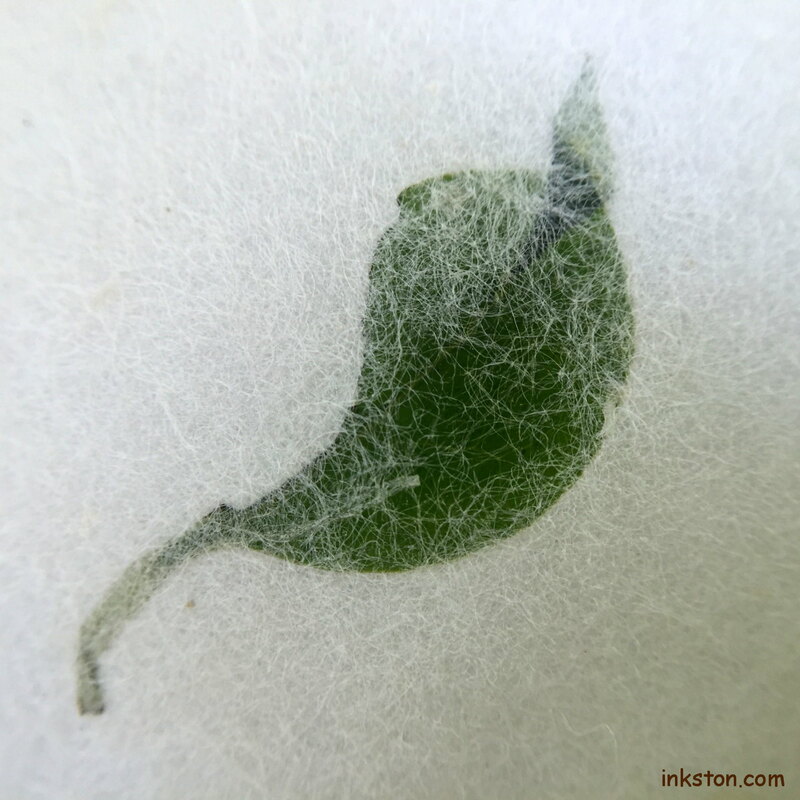 Uncooked Xuan paper can absorb a lot of ink at very fast speed and creating a lot of beautiful and surprising effects. A lot of professionals are very keen on using uncooked Xuan paper and it is widely used for big landscape Chinese water ink painting. Since it absorbs ink and water very quickly, it is easier to use dark ink to paint on raw Xuan paper. If the ink is too light, the colour will be absorbed into the paper and the effect might not be as strong as you expect. Therefore, raw Xuan paper requires painter to have good skills of using inks. The ‘raw’ Xuan paper, is also known as a truth or honest paper: due to extreme water absorbency the paper records the detail of every watercolour brush stroke painting: the paper cannot lie, changes cannot be hidden. 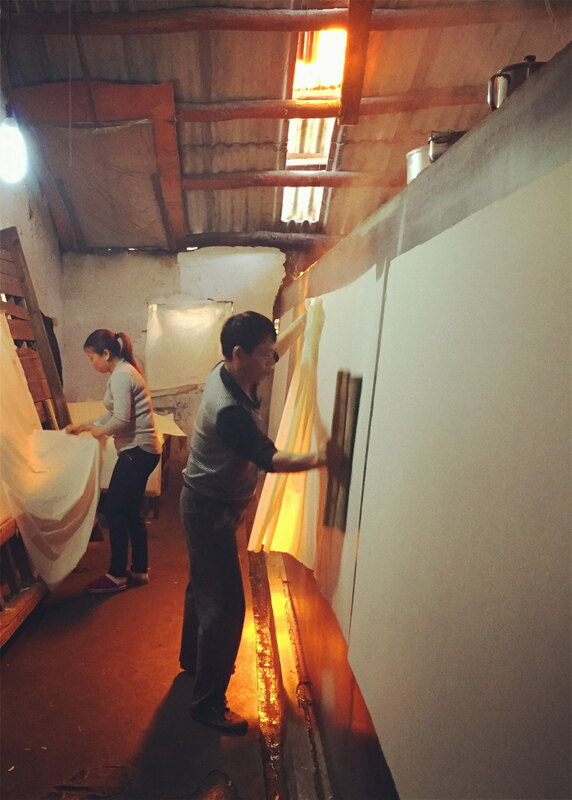 As we travelled through Anhui province meeting the artists we found they invariably used the raw Xuan paper, though they were quite emphatic that this kind is not for beginners since it doesn’t allow for mistakes! ‘Cooked’ Xuan paper: (Chinese 熟宣 shú xuān). ‘Cooked’ paper is the chinese name for sized paper. Raw Xuan paper is completely unprocessed, and absorbs ink very quickly so ‘sized’ paper is also produced, to lower the absorbency and provide for the differing requirements of different artistic styles. ‘Cooked’ Xuan is widely used for Gongbi fine detail painting, as the paper needs to take many detailed brush strokes. Cooked Xuan paper can also be decoratively finished with coral, silver/goldflakes, dry flowers/leaves, etc. ‘Half-cooked’ Xuan Paper: (半熟宣 bànshúxuān) this type of Xuan paper has the combined characteristics of uncooked and cooked Xuan paper. It has higher water absorption than cooked Xuan paper while lower than uncooked Xuan paper. In general, you can differentiate these types of papers by checking them with water drops. If the water drop is absorbed quickly on the paper, then this is uncooked Xuan paper. If the water drop almost doesn’t go into the paper, it is cooked Xuan paper. If the water drop is absorbed slowly, then it is half-cooked Xuan paper. For professional Xuan paper making, we have two major classification for Xuan papers according to the percentage of the Pteroceltis Tatarinowii bark. 净皮Jing Pi xuan paper: This category refers to professional handmade Xuan papers which contain at least 60% Pteroceltis Tatarinowii bark. Both of these two types of Xuan papers are professional grade Xuan papers. They are professional Xuan paper for calligraphy and sumi e/ Chinese paintings. – 特种净皮 Te Zhong Jing Pi: 80% Pteroceltis Tatarinowii Tree Barks, 20% rice straw. It is the highest grade professional Xuan paper. – 净皮 Jing Pi: 60% Pteroceltis Tatarinowii Tree Barks, 40% rice straw. 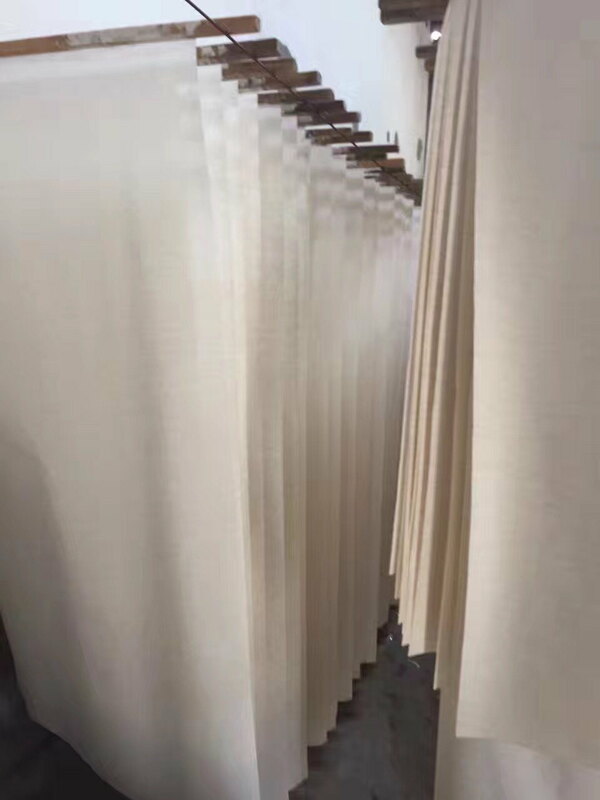 棉料 Mian Liao Xuan paper refers to the type of Xuan paper which contains 30% Pteroceltis Tatarinowii tree barks and 70% rice straw, or 40% Pteroceltis Tatarinowii tree barks and 60% rice straw. Such type of paper is suitable for normal calligraphy and painting purposes. How to judge the quality of Xuan paper? cloudy-shaped fibres, then this Xuan paper has quite high quality. 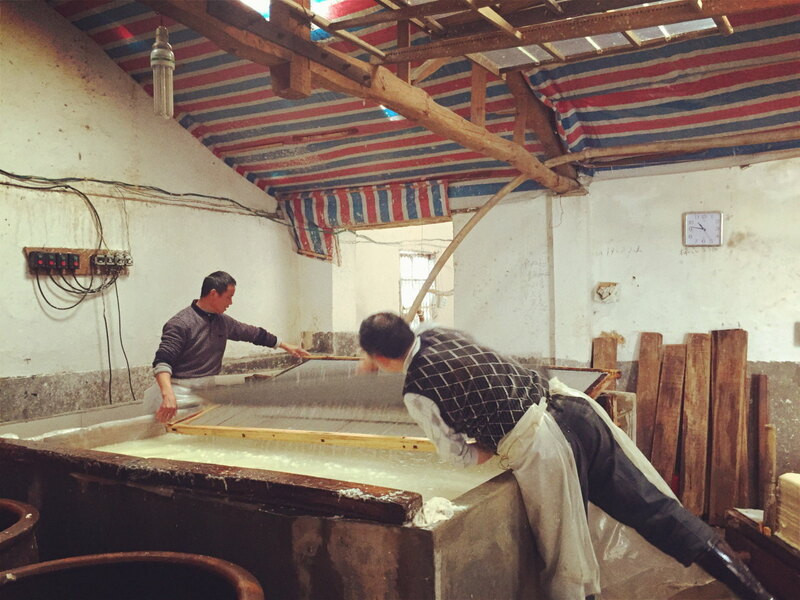 These cloudy-shaped fibres are tree bark, which is the main costly raw material used to produce Xuan paper: the more bark the higher quality the paper. You may see fibres of dry grass and other materials depending on the composition and finish of the paper. Test the paper with inks. Prepare different kinds of inks, dark ink, less dark ink, light ink, very light ink etc. And try these different inks on the same piece of Xuan paper. High-quality Xuan paper is always able to show the clear edge between different inks and the brush strokes. Also, since the high-quality Xuan paper has very high amount of tree bark, it doesn’t fall apart even after absorbing a lot of ink. If the paper breaks after absorbing too much water from the ink, then this paper probably has lower proportion of bark fibres and it is not the best quality Xuan paper. Normally, professionals use these two methods at the same time to determine whether the Xuan paper is authentic and good quality. However, you can use the first method alone (checking the paper under sunlight) is simple enough to determine if the Xuan paper is authentic. Xuan paper is traditionally made in large sheets but of course it can be cut! 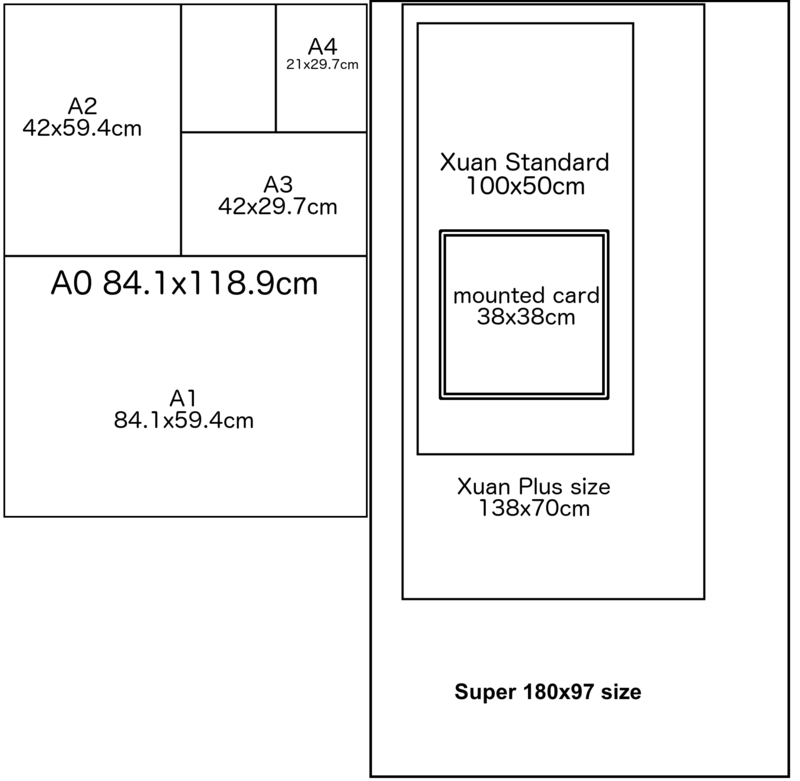 Be sure to check the size when looking at different Xuan paper shops as some sellers simply cut the paper into smaller sizes to make the cost per sheet seem cheaper. Standard Chinese sizes are difficult to compare to international sizes since they are so large and not the same proportions either, but to get an idea this diagram shows the sizes on sale in the shop. 700 x 1380 1 sheet is equivalent to 15 sheets A4. This is Inkston Plus size, made with a two-person frame as shown in the picture below. Double Xuan is double layer Xuan paper, it is literally twice the thickness and weight of standard single Xuan. This means it can hold more moisture and is popular among artists with a watercolour background and also often recommended for students as more forgiving than single Xuan when learning to control the flow of ink. 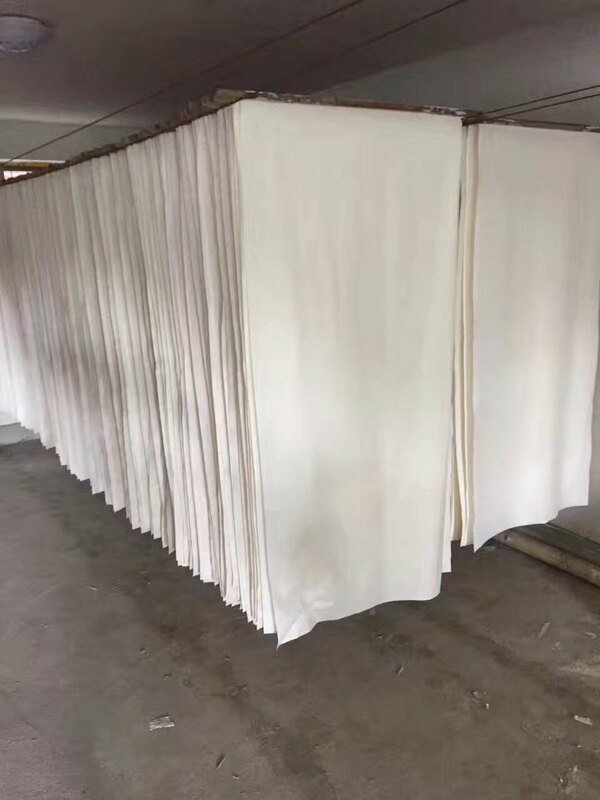 The half-sized or half-cooked Xuan paper is deliberately less absorbent than raw unsized Xuan paper, while remaining more absorbent that the cooked Xuan, so it is flexible for different styles of painting. This category includes Shikishi card papers which are also half sized. 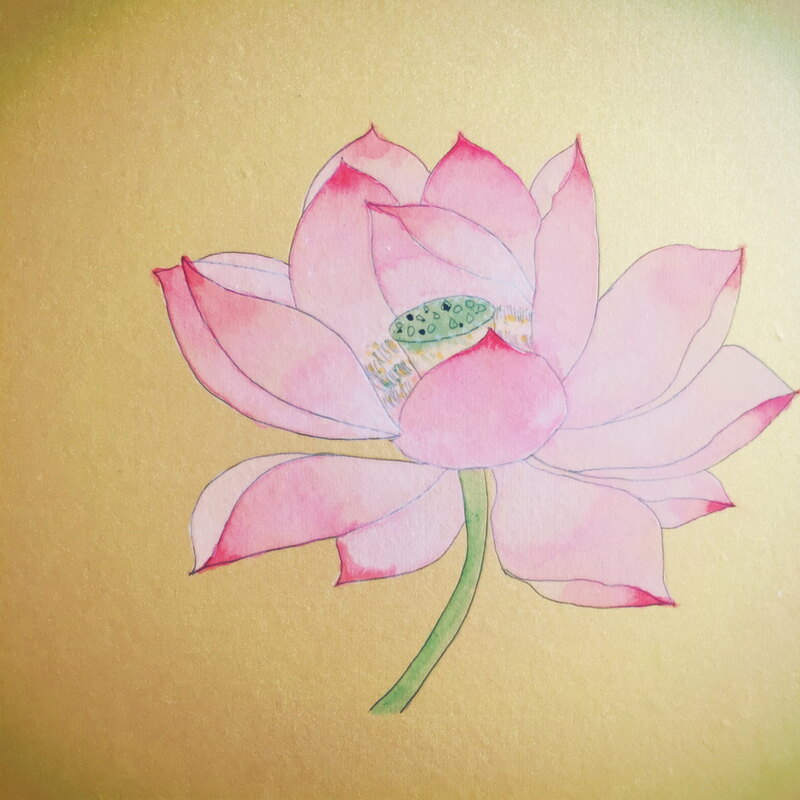 A range of Xuan papers mounted on card (called Shikishi in Japanese) as featured in "How to paint Gongbi style: Lotus Out of Water". These include gold, red, white and other colours and designs, in square, circle or other traditional shapes, mounted onto square card. Available in 38x38cm (15inch) and 33cmx33cm (13 inch) sizes. The sized papers are suitable for painting styles such as Gongbi detail painting which require less absorbent paper. These handmade Xuan papers are made with Eulaliopsis binata called in Chinese 龙须草 “Dragon beard grass” also known as Chinese alpine rush. They are deliberately not as absorbent as the tree bark paper to facilitate different styles of painting. 红星 Red Star is China's premium paper brand and uses only the finest grade materials and strict quality control process. This is reflected in the price and quality of the output. These are silk and fabric alternatives to paper pre-mounted onto fan ready for decoration with painting and/or calligraphy. Silk/fabric fans can also be used to do embroidery. A range of unmounted Xuan papers in traditional shapes and designs and a variety of sizes. How to look after your Xuan paper and options for mounting your finished painting or calligraphy. Wang Zirang a follower of Huang Binhong and leading Xin'An artist tells us about Chinese Su ink painting. ¡Gracias! Sí, son papel hecho a mano de China para la caligrafía y las pinturas chinas / japonesas.